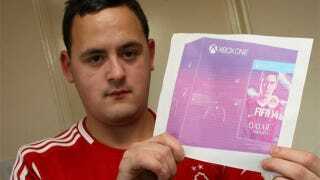 English teenager Peter Clatworthy made some very bad decisions during an Xbox One auction on eBay, paying £450 (USD$735) and not even getting a console. He got a picture of a console. The 19-year-old student told the Nottingham Post that he'd saved up the money so that he could buy the console as a surprise Christmas present for his four year-old son (right). Instead, he got the picture. And it wasn't even a good picture! Just a crummy print-out. Despite the listing stating it was a photo of an XBox One Day One edition console, Mr Clatworthy said he'd expected to receive the console as it was listed in the video games and consoles category on eBay. He instead received the photo in the post on Monday, with it having 'thank you for your purchase' written on the back. All's well that ends well, though, as with eBay's help he got the money back. Well, sort of. He still doesn't have an Xbox One. No word on whether he got to keep the picture.